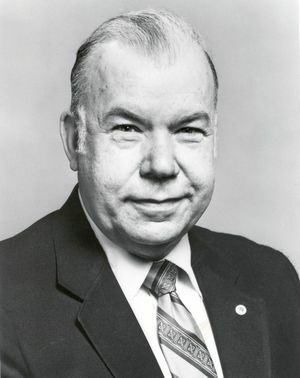 Russell C. Drew, IEEE President, 1988, co-founded and was president of Viking Instruments Company. He later supervised the development of an advanced spacecraft tandem mass spectrometer. Dr. Russell C. Drew served in the U.S. Navy from 1953 through 1973, and spent most of his career working on nuclear submarine ballistic missile programs, including Polaris and Poseidon. He also served as assistant to the President's Science Advisor, 1966-1972, and director of the staff of the President's Space Task Group. His last assignment, as a naval captain, was as the head of the Office Naval Research (London). Thereafter he served as the director of the Science and Technology Policy Office of the National Science Foundation, 1973-1976, and in several capacities in the aerospace industry since 1976. He also was co-founder and president of the Viking Instruments Company, in suburban Northern Virginia, and president of Science and Technology Consultants Inc.. where among other things he led the development of an advanced spacecraft tandem mass spectrometer under contract with NASA. Drew earned a Ph.D. in Physics from Duke University in 1961. Drew served as IEEE Vice President for Professional Activities and Chair of the IEEE United States Activities Board in 1984 and 1985. He was IEEE president in 1988. This page was last edited on 25 February 2016, at 19:04.